Imagine a world filled with potential, courage, beauty and light being created by Dr. Bishnu Maya Pariyar, a gentle warrior ensuring the Dalits, the untouchables, of Nepal have their rights and live with dignity. Founding EDWON (Empower Dalit Women of Nepal) in 2003, Dr. Pariyar has supported more than 15,000 children gain access to schools and invested in micro-finance projects for women to gain their economic independence. Reaching across cultural, gender, religious divides, Dr. Pariyar empowers women to work together, claim their dignity and their human rights. With the release of Untouchable, a beautiful photographed and documented film, produced by Join the Lights, Dr. Pariyar returns home to explore her roots, the impact of her projects and the future opportunities for all the women and children. It has been a long journey for Dr. Pariyar watching her father work into the night as a tailor, being discriminated at school and not being able to drink out of the same water jug as the other children. Systematic discrimination sears her heart and memories. Yet, her father, the letter writer and reader for all of the families in the village separated from loved ones working abroad, was only allowed to be a tailor due to his status as a Dalit. Even with his limited education, her father knew that an education was access to freedom and encouraged his daughter to persevere and pursue her dreams of an education. Now, Dr. Pariyar after years of pursuing her education both in Nepal and the United States, stands on the world stage, honored and recognized as a scholar and a social entrepreneur. 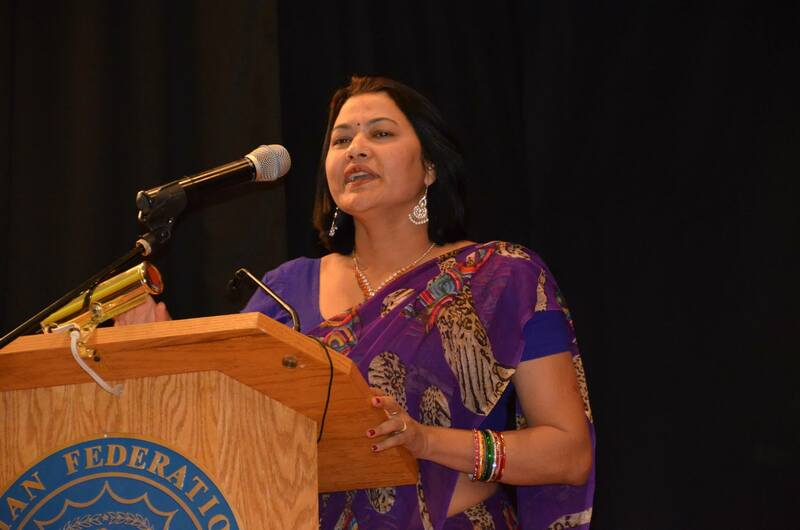 Speaking to international organizations, students, and business leaders, Dr. Pariyar inspires others to join and support her endeavors in Nepal to educate even more children and invest in even more women to achieve their own economic independence. Very small investments, invested locally, has had dramatic impacts, Dr. Pariyar has discovered. Most recently, the European Union has established a partnership with EDWON to support their projects in Nepal. Dr. Pariyar is taking her message of dignity for all and the success of EDWON to a larger global platform. She recently announced the new goal to raise over $500,000 to make a difference in the lives of more than 10,000 women and children. In addition, Dr. Pariyar has a special wish to meet the First Lady Michelle Obama at the White House to share how she has been able to empower so many women and children with dignity and hope for their future. I want to see in this world that everyone is equal. There should be no discrimination in terms of caste, religion or gender. Everyone should live freely and with dignity. For me, dignity is the biggest word because I know how this is. We did not have dignity growing up. For me this is the life. You know you have dignity when people treat you like human beings. Dr. Pariyar is an inspiring leader and role model every citizen around the world should embrace. Dr. Pariyar is the leader Emma Watson spoke about at the United Nations General Assembly promoting #HeforShe. Dr. Pariyar is seeking equality for all, seeking a chance for all to live with human dignity. By Keri Douglas, writer/photographer, Washington, DC. All rights reserved. For more information on EDWON, visit www.EDWON.org. Dr. Bishnu Pariyar Copyright © 2013 US Nepal Media Center, All rights reserved. Tags: Bishnu Maya Pariyar, Dalit, Dr. Bishnu Pariyar, EDWON, Emma Watson, Empower Dalit Women of Nepal, ethnicity, First Lady, freedom, gender, Guest speaker, Hindu, human dignity, Inspiration, inspiring, Join the Lights, Michelle Obama, Nepal, race, religion, respect, social entrepreneur, The White House, UNGA, United Nations, woman leader, women and children. Bookmark the permalink. Excellent post. Really enjoyed it. Wish I could meet this woman. I will invite her to speak in Washington, DC. Bishnu is an amazing woman with unlimited courage. Will keep you posted. The Srijanshil Nepali Samaj-UK is organising a Welcome & Interaction Programme for Dr Bishnu Maya Pariyar on Sunday, 13th November 2016 @ 3pm at Bhetghat Gurkah Restaurant, Aldershot Town Centre, GU11 1BH, United Kingdom.